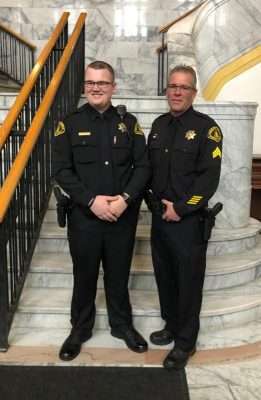 Chandler Peay has long dreamed of becoming a member of the Plumas County Sheriff’s Office. He began his career in dispatch and recently completed his training as a deputy. 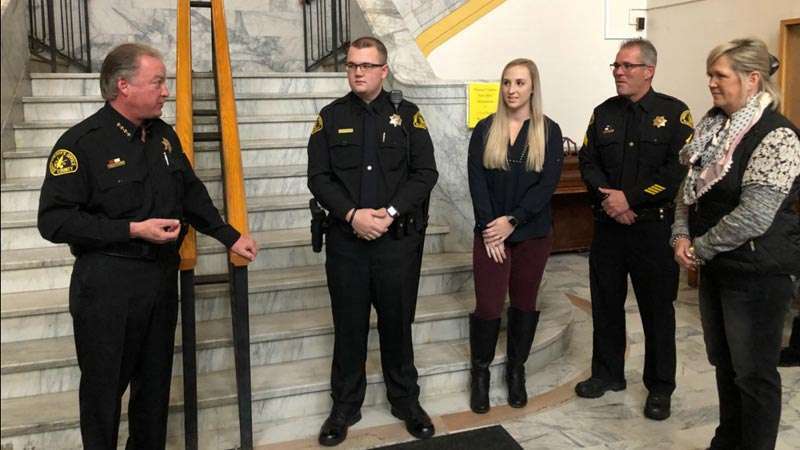 Plumas County’s law enforcement family gathered Wednesday, Jan. 9, to welcome the son of one of their own to the ranks. Sheriff Greg Hagwood had the honor of welcoming the department’s most recent member, Deputy Chandler Peay. Peay is the son of Investigations Sgt. Steve Peay who moved up through the program’s ranks. Hagwood said he knew that the younger Peay always had his sights set on becoming a deputy sheriff. He began his career in dispatch. Then he moved on to attend officers’ training. Chandler Peay’s wife Tanah was on hand to do the honors, pinning the shiny star on her husband’s new black uniform. Then it was time for his family to congratulate him on his most recent accomplishment. 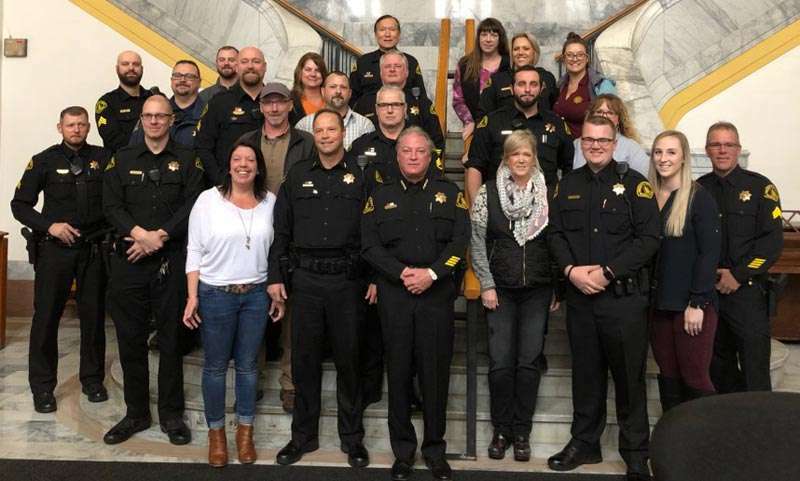 And finally, everyone from the extended county law enforcement family — officers, dispatchers and staff — joined the newest deputy in a departmental photo. As many members of the Plumas County Sheriff’s Office as could attend were on hand to welcome their newest member Deputy Chandler Peay. Peay appears in the front row toward the right. He is flanked by his mother, Barbara Taylor; wife Tanah; and his father, Investigations Sgt. Steve Peay.